At What Age Would Barry Bonds Finally Be The Worst Hitter In Baseball? Do you want to see Barry Bonds sock a few dingers? Bonds is 52 years old now, and back with the Giants, and seeing him step back in the cage (he is still in remarkable shape) forces us to wonder: Could Bonds still play? We are obviously among the biggest Bonds stans there are, but we are not alone here. Grant Brisbee mused what Bonds might hit if he were to play 2016, and came up with a triple slash of .166/.314/.368 largely in pinch hitting duties. For what it’s worth, we think Brisbee’s being too conservative. 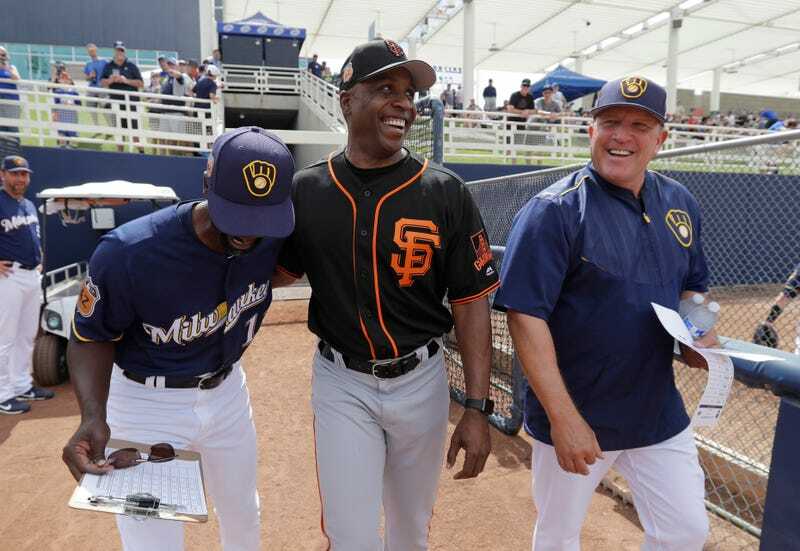 Remember, Bonds still topped the Marlins’ best hitters in a casual home run derby last season. Tom Scocca puts Bonds at .260/.360/.410 for a theoretical 2017 comeback season. But that’s not the question I’m asking here. The question is this: If Barry Bonds returned to baseball, and kept playing, at what age would Bonds be the worst hitter in the big leagues? We’ll use OPS, or on-base percentage plus slugging percentage, as shorthand. Even Brisbee’s pessimistic projection would mean an OPS of .682. (Scocca’s would put him at .770. Bonds’s final season, in 2007, his OPS was 1.045.) In 2016, the worst OPS among qualified MLB hitters was Adeiny Hechavarria’s .594. Preceding years were slightly lower. Obviously Bonds would be a liability on the bases, and in the field if he were on an NL team. But I really, truly believe that Bonds could play another five years—let’s call it his age-58 season—before his OPS was the lowest in MLB. Try to tell me I’m wrong.